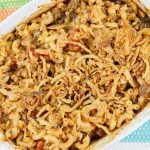 Ground Beef Casserole with French Fried Onions - Crunchy Beef Bake! 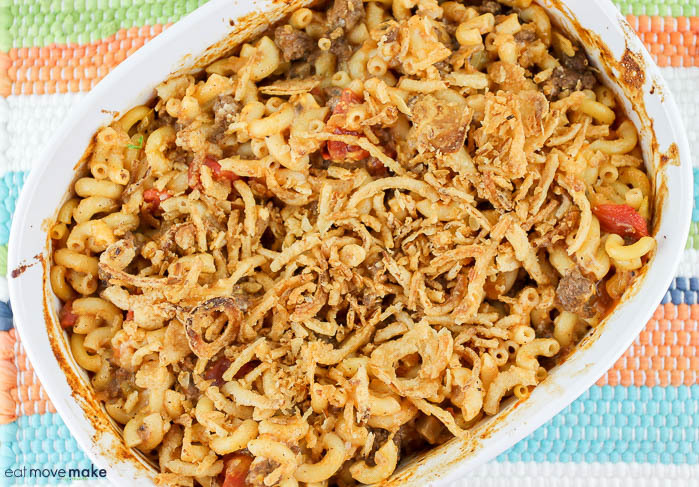 Crunchy beef casserole bake — come and get it! That’s the fancy (ha ha) name for this ground beef casserole with french fried onions from my childhood potluck hotdish days. Casseroles are my jam; there’s no doubt about it. They’re always hot and satisfying and they remind me of the Midwest. I’ll never move back to the wintry north… but I love the feeling of “home” and I can easily bring that to my dinner table sans the snow. 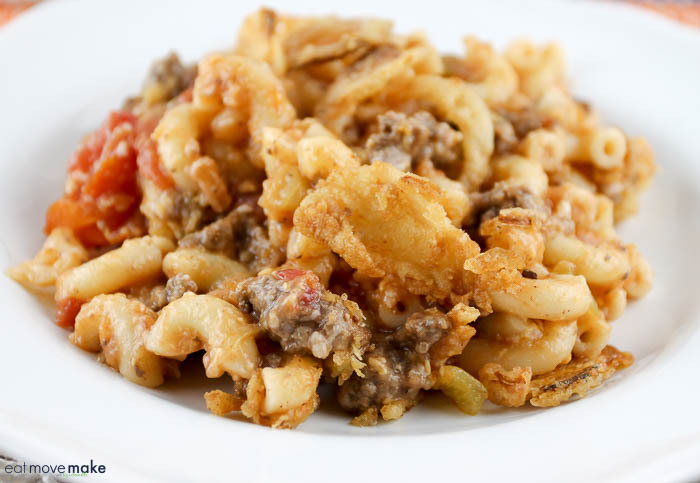 Sometimes I make old family favorites like this ground beef casserole with french fried onions, and sometimes I just toss this and that together and make up new casserole recipes. But they’re always hot, hearty and feel-good delicious. And honestly what I love most about casseroles is that it’s hard to screw them up. Add something, omit something… casseroles don’t care. Somehow everything just comes together and it works no matter how you twist things. Prepare macaroni according to package directions; drain. While pasta is cooking, brown ground beef; drain off fat. In large bowl, combine all ingredients except onions. Pour half of the mixture into a 2-quart casserole dish. Add half of the onions. Pour remaining mixture over onions. Cover; bake for 30 minutes. Sprinkle remaining onions on top and bake uncovered for another 5 minutes. I love a good casserole recipe and this one won my heart, Liz and Chanelle. Can I use red onions for this recipe?